New company, new typeface, new era? Nokia has decided that a new font is just the ticket to go along with a major rethink at the company, with the Nokia Pure typeface billed as bringing 'beauty in supreme usability'. Just in case you thought a major partnership with Microsoft on Windows Phone 7 and a 'repositioning' of its Symbian OS weren't enough, Nokia has gone one further and given us a new font. 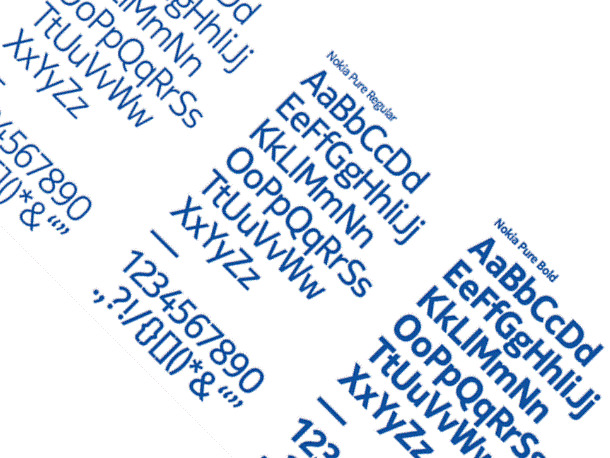 "For a brand like Nokia, looking to reinvent and revitalise, the typeface literally sets the tone," explained the company on a blog. "In many ways, it's the touchstone for every other visual element in the branding palette," it continued. "So it needs to be considered, rigorous and send out exactly the right message. "Logically enough, the starting point for our brand new typeface, Nokia Pure, was also on-screen legibility at small sizes – although now we're talking about the pin-sharp colour screens of contemporary smartphones. "At the same time, we also needed a recognisable corporate typeface, versatile enough to work well in all manner of different environments – from other screen-based formats, to a whole host of printed materials." The font, which we're sure cost a pretty penny as it came from Font-meister Bruno Maag, is meant to achieve 'harmony through simplicity'. "So the new font also helps us create a sense of harmony. Harmony between the various different parts of a large, global company. And harmony between the different elements of the Nokia brand and design language," states Nokia. So, essentially, it looks nice on a small screen. Well, why didn't you say so?